We welcome Emma Pack, one of the excellent debt advisors we have here at StepChange Debt Charity. Today she chats about her clothes-buying experiences and where to buy without breaking the bank! I’m a single 20-something woman with £30 in my back pocket. What should I do with it? Drinks with friends? A new pair of jeans? A ‘take out’ and a film? Or could I do a couple of the above? I can go into most high-street stores and get a new pair of trousers for £30. That’s £30 on one item, my entire month’s clothing budget gone. One pair of trousers but no fun! So to try and make my money go further I’ve been looking around for some ways that I can get good clothing at a price that suits my budget. Month 1: I went into my local town and went into the market; they had lots of cheap clothes however I still found I couldn’t get much for my £30. I managed to get a pair of black trousers and a nice pair of socks. Cheap was not cheerful and the quality of the goods left a lot to be desired. Month 2: I went browsing around charity shops. I found that my £30 went a long way, I managed to get three shirts for work at £1.50 each and I also managed to get myself two pairs of jeans and one pair of trousers, all for £28.50. The clothes were in really good condition and although I had to walk around a few charity shops it was well worth the looking and I felt great with the savings I had made. Six items for £30, and decent quality as well! Month 3: I decided to look at websites; one that came straight to mind was eBay – the natural stomping ground of the seasoned eBargain hunter. I managed to get a bundle of clothes for just 99p (lots of people sell bundles of clothes on there, something I didn’t know before!). Yes, okay, the postage was £5 but still, ten items for six quid! Some of the items weren’t perfect but there were some I could make use of and for £6 can I really complain. Month 4: I thought I’d exhausted most of my frugal shopping ideas and then by chance I stumbled across Freecycle. It was a bit of a pain at first because I had to sign up and I had to wait for a moderator to accept me but once I got on the site it was great, people were actually giving (and getting) stuff for free. I managed to get a leather sofa, clothes and shoes, and loads of cooking utensils, all for free. What’s the catch? There wasn’t one – all I had to do was collect the stuff. When you sign up, you sign up to your local Freecycle, this means you don’t have to travel halfway around the country. 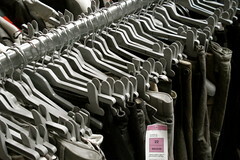 There are many other ways that you can find cheap clothing it’s a case of keeping your eyes and options open. Yes it takes time and yes the clothing may be used but who is going to know unless you tell them? I’ve got my new tops, new jeans, pizza on the way and a bottle of wine in the fridge (and something new to sit on). Do I still think my £30 pair of trousers was a bargain? Not a chance!